Aiming to write GMAT sometime between the middle and end of November. Starting in October I can dedicate all day to studying. I have bought MGMAT 6 edition books as well at the OG16 books. I took a cold practice test and scored a 490 (38q 23v). I got lazy and skipped a ton of questions, including the essay part and most IR questions. My goal is to get at least 700 to make up for a poor GPA. Any recommended study plans or tips to achieve my goal. How many hours should I be targeting? To raise a 490 to a 700+, you will have to make significant improvements to how you handle BOTH the Quant and Verbal sections - and all of that work will likely take at least another 3 months of consistent, guided study. Based on the timeframe that you've described, you'll have just 1.5 to 2 months though - and that will likely not be enough time. The type of 'cramming' that you're talking about (studying "all day" during that time period) rarely leads to great results and actually increases the chances of 'burnout' before Test Day (and that is something that you want to avoid). Is there a reason why you're limiting your studies to such a relatively short period of time? I understand that to make the jump requires some significant improvements, but its something I am looking forward to. I enjoy a good challenge. I would be planning to apply for September Intake. I don't mind pushing the exam to December but come January my plan is to start studying for CFA level 2. The cramming is something I did while writing CFA, so it is something I am confident I can handle again. I treated it as a full-time job, studied about 9 hours a day. Let me first say that I just graduated from my undergrad in June and that this is a backup plan in case nothing comes up in terms of work within the next year. I live in Canada and plan to apply to a couple of pre-experience MBA COOP programs (McMaster and Laurier). These only require a 600GMAT but I want to get as best as possible obviously. I know that people say don't get an MBA without experience and so on, but this program has helped a ton of people break into finance and the COOP program helps get experience. I also plan on applying to 2 Masters in Finance programs. 1 being at McGill and the other abroad in France at EDHEC. McGill avg GMAT is 690 and EDHEC does not say. 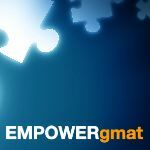 There's a significant difference between a 600 and a 700 on the GMAT, so you have to be honest about your situation: If, in the middle of November, you scored 600 on the Official GMAT... would you accept that score and stop studying or would you continue to study with the goal of scoring 700+?